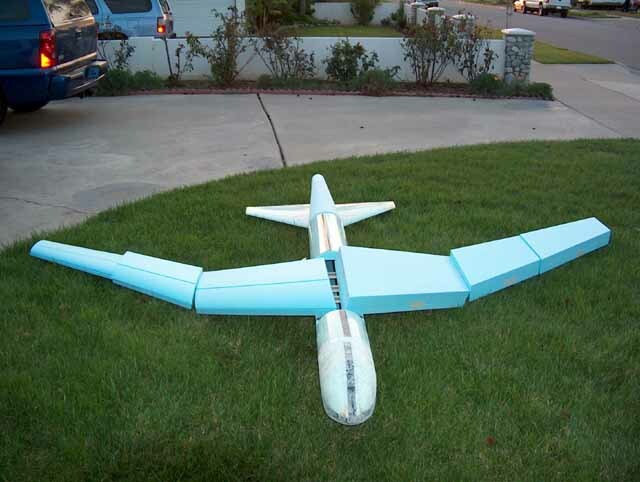 Yes, it is a bit crazy to spend so much time building a model airplane, and then chucking it off a cliff, but that is what Slope Soaring is all about. This web site is culled from the RCGroups discussion forum where I have a discussion thread on the building of the plane. 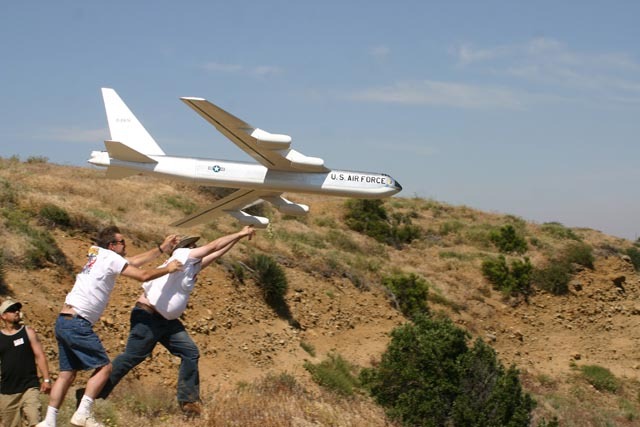 If you don’t know what Slope Soaring is, check out this link. PSS is Power Scale Soaring. Basically, that means making a model glider of a powered plane. I had been working on this project mentally for a few years, but now I am finally getting to my B-52 project. I now have cut a 2.5 foot test section from blue foam. 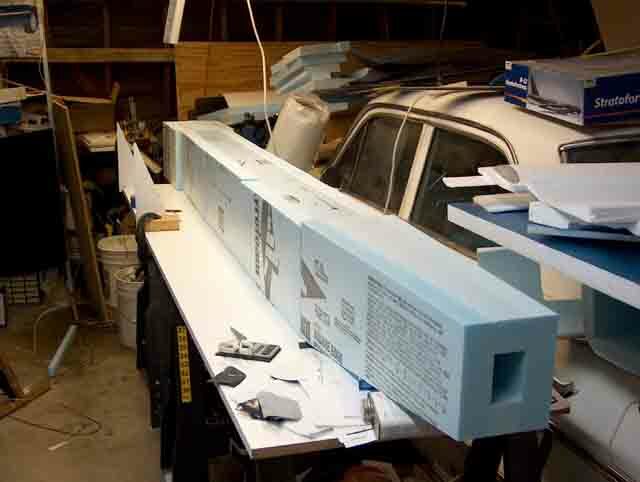 Next I fiberglass it run it through rigorous torture testing (kick it around the garage) to see if it will be strong enough when it is 9.5 ft long. 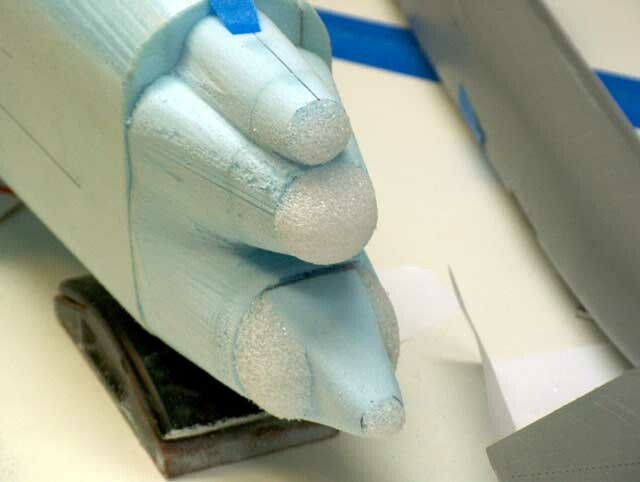 In this short a length, the blue foam seems pretty strong. 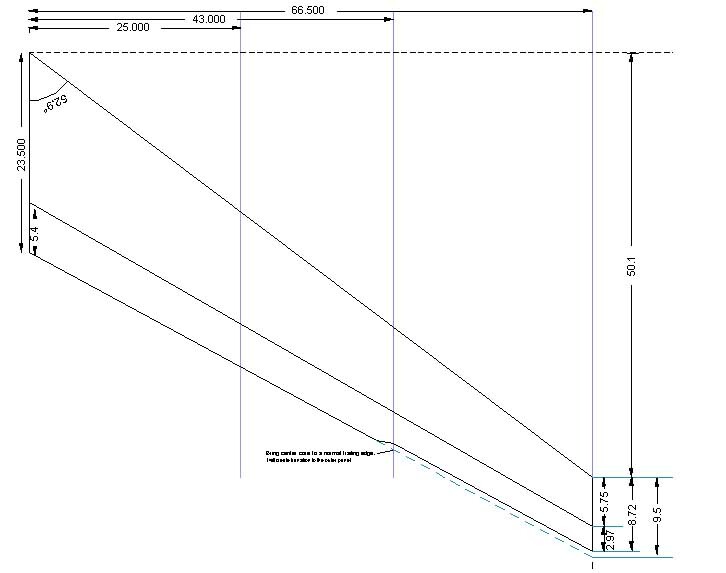 I am sure that would be different when built out to 9.5 ft. 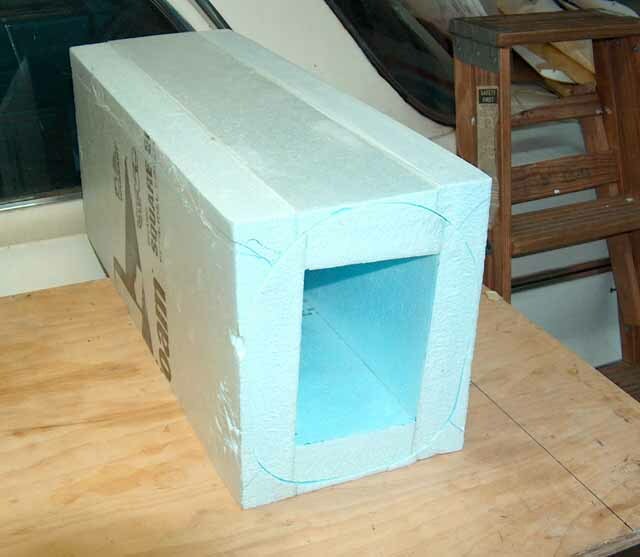 I have been making the box with four pieces of blue foam, glued together in a box shape with 3M spray glue. It did not seem to stick together that well, but I didn’t let it dry overnight like I should have. To impatient, I guess. 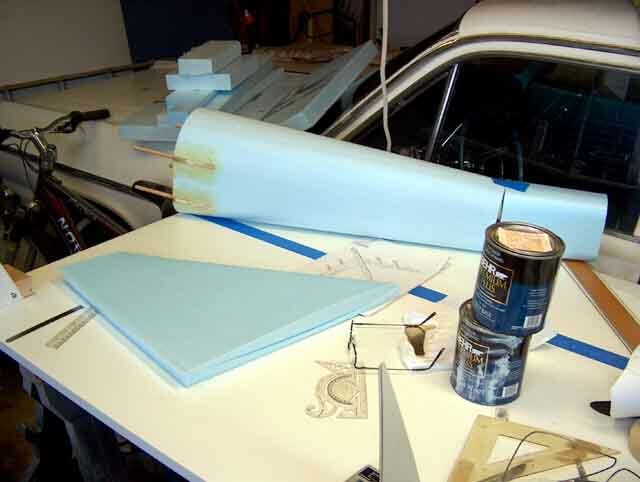 Once the fiberglass is on, the glue between the foam won’t be that important, and it will have plenty of epoxy oozing into any gaps. 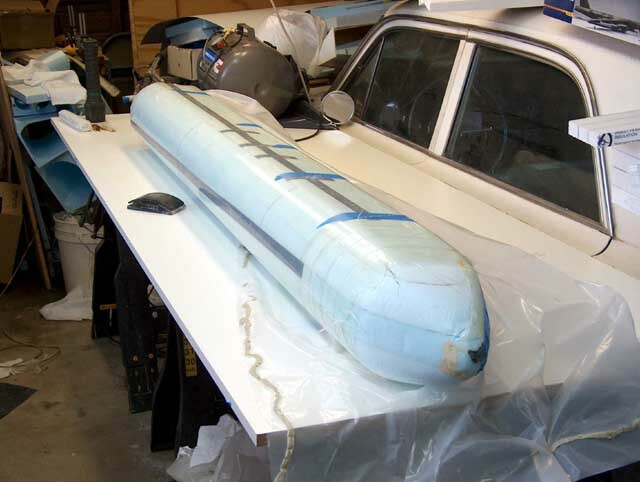 The plan is to put two or three layers of heavy fiberglass and one layer of light on the bottom. Let that dry, sand off the rough edges, and apply one or two layers of heavy and one layer of light fiberglass to the top and sides. This is going to be a real goopy mess!! 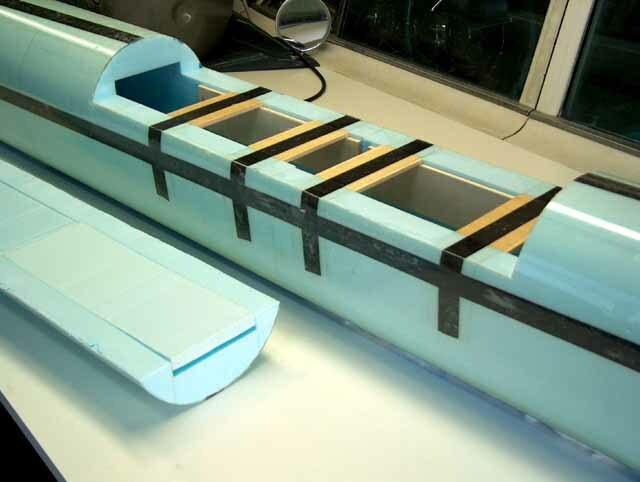 For the real thing, I will make 4, two foot sections like this, glue them end to end and add the nose and tail sections to make a complete fuse. Does anyone else see a B-52 fuselage in all that blue foam? 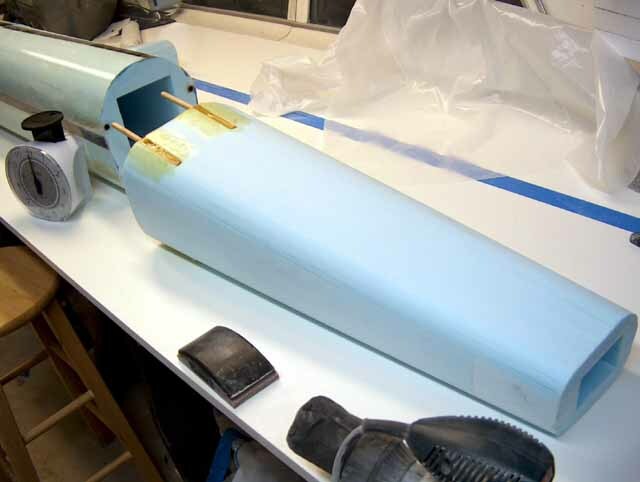 My gut feeling is that the blue foam is pretty strong, and that even a small amount of fiberglass will add the stiffness needed. But how that works out over 9.5 ft of fuse, is another matter . The span will be 11 feet. Wings will detach at the inboard engine nacells, and the tail section will need to detach so it will fit in my truck. I am also thinking of making the elevator a full flying elevator. Less worry about setting incidence and having enough throw to make it handle. My hot wire cutter got a good workout today. Now you should be able to recognize the B-52 fuselage a bit. I decided to try vacuum bagging my test section to see how that would work. I quickly discovered that I needed to stuff the hollow center with scrap foam to keep the bag from getting sucked inside to the point where the seal broke. I also noticed that the bag wrinkles and the wrinkles could not be pressed out, so now I wish I had used the plastic sheet as you would when doing a wing. I got the joiner system of dowels finished. These will allow the tail section to come off for transport. Amazingly, I managed to get all four dowels to be parallel to each other, so it comes apart without binding. 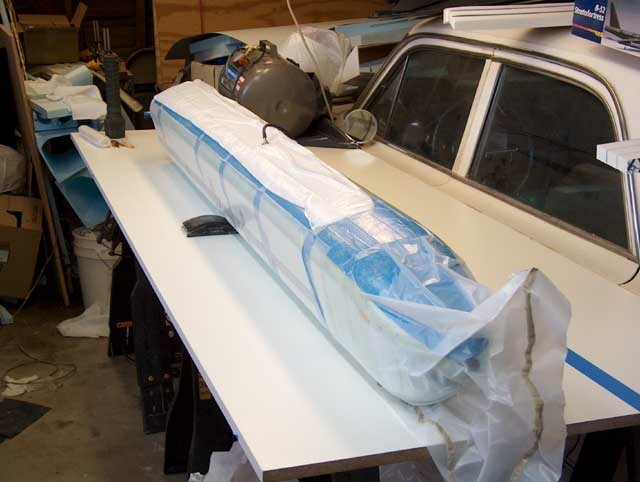 Right now the fuselage is all wrapped up in the plastic vacuum bag and a electric blanket (supposed to cure the resin above 70 degrees F). 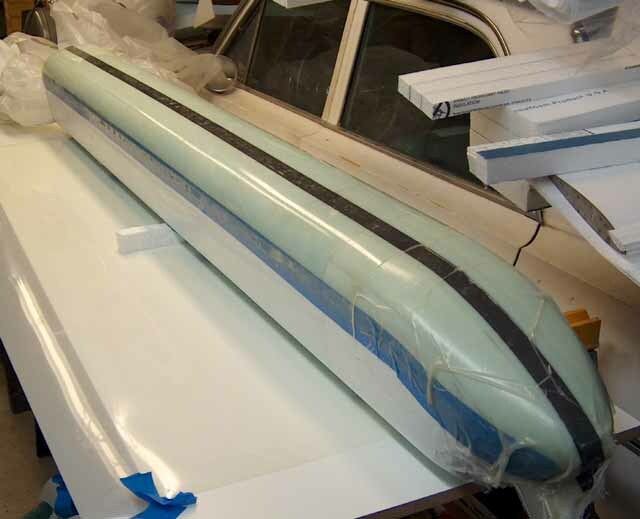 The bottom section is getting four layers of 6oz fiberglass and a one inch wide ribbon of carbon fiber. 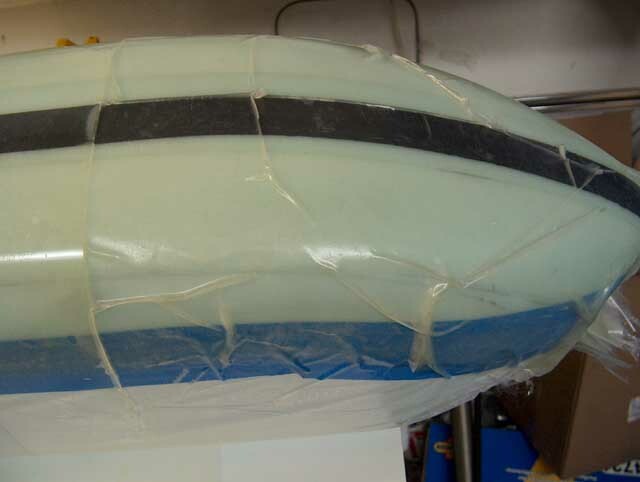 The nose got a couple of extra layers of fiberglass cloth for the inevitable impacts on landing. Tomorrow evening it will come out and I will see how things went and the cats will be grateful for a quiet nights sleep without the vacuum pump. Then I get to repeat the process for the top of the fuselage. Since I don't have time to take pictures when I am putting the laminates together, I thought I would show the the layers in reverse order. The Burrito. This is the plastic sheet on the outside that aids in keeping the heat from the electric blanket inside. The electric blanket which keeps things at 85-90 degrees. The resin needs at least 70 to cure, so the cold garage needed some help. My wife now knows I am crazy after I bought a electric blanket just for my model airplane. Down the the vacuum bag itself. 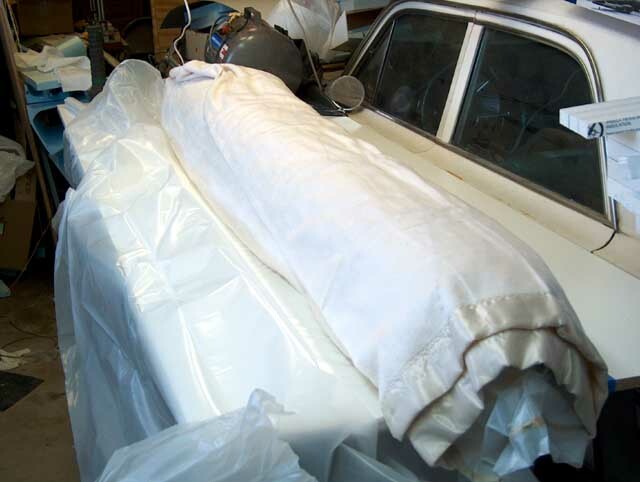 The white stuff on top is "breather cloth" which helps provide passage of the air to the fitting on the bag through which the air gets sucked out from. Bag partly removed. 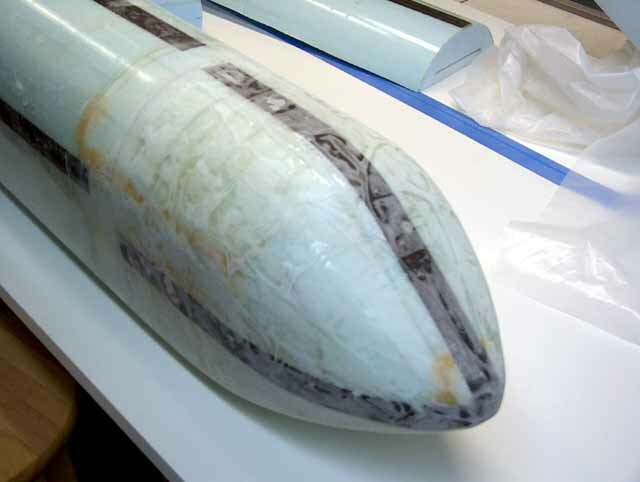 Now you can see the Nylon sheeting that wraps around most of the fuselage and gives a smooth surface. 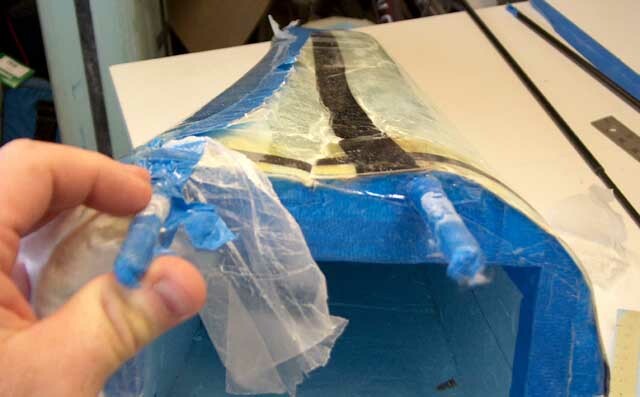 Since the fuselage is hollow, the bag needs to go inside the hollow area to keep from crushing the foam a bit. 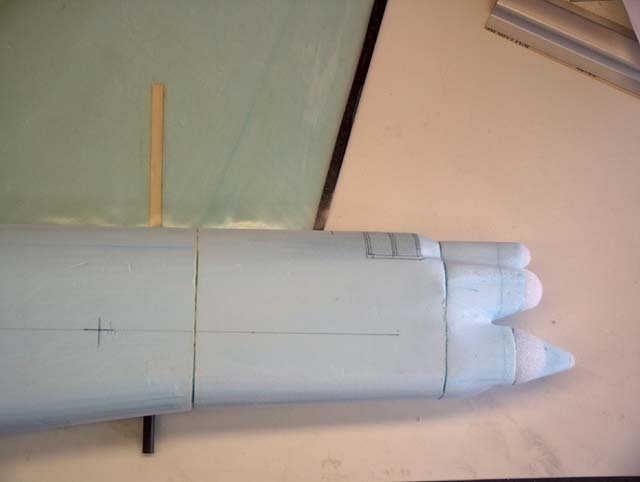 On my test peice, I did not do this, and the sides of the fuselage bowed in ever so slightly. Think of it like trying to vacuum bag a plastic cup. Now the Nylon sheeting comes off, revaling (finally) the finished surface. 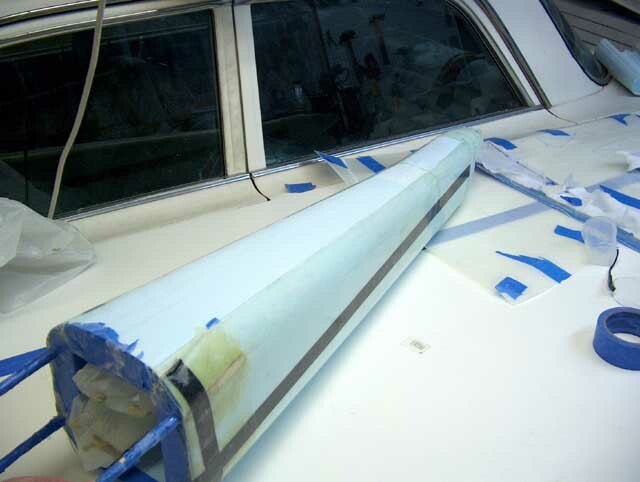 The blue tape is masking off the fiberglass on the bottom of the fuselage. I will take my dremel cut off wheel and cut along the edge of the blue tape. 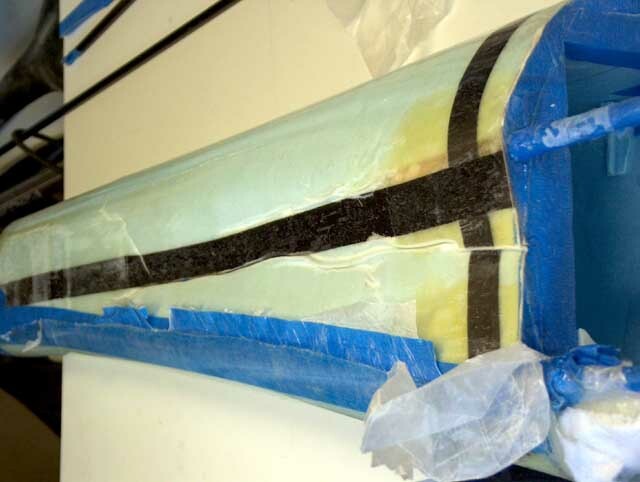 Then break off the extra fiberglass and then remove the blue tape. After that, sand the transition between the two layups. 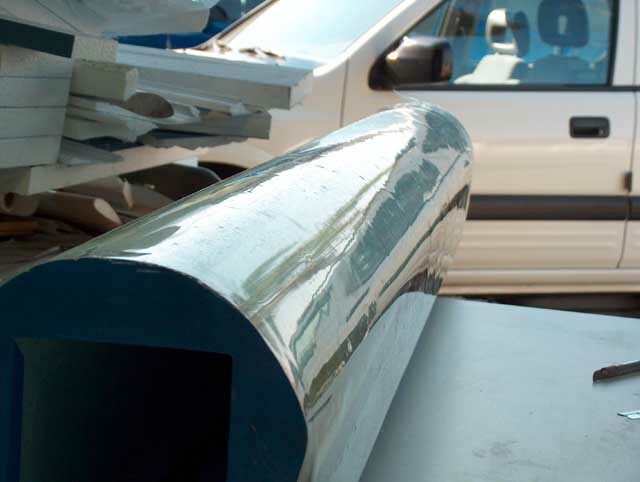 When it works right, you get a mirror smooth finish. As expected the nose was a minor disaster. Nothing that can't be cleaned up, but the lesson learned was: not expect large sheets of fiberglass to wrap around a curved nose very well. I will use small overlapping peices for the nose next time and save the big sheets for the straight areas. I had experimented with a single layer of dry fiberglass, but I guess that is more flexible. Here is the wing saddle after I cut it out. 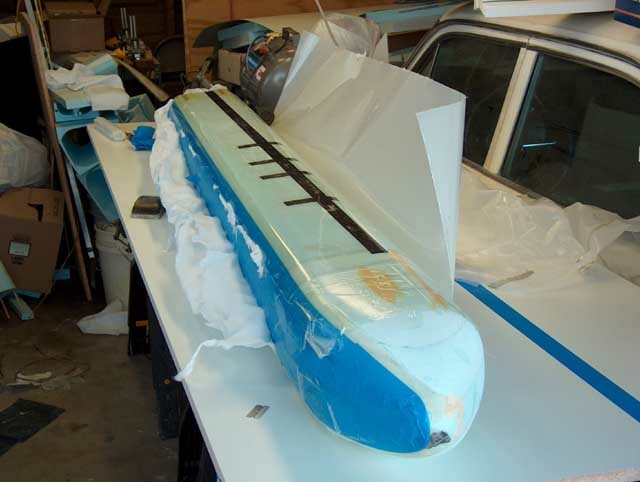 I had cut the foam and added the plywood before fiberglassing the fuse. 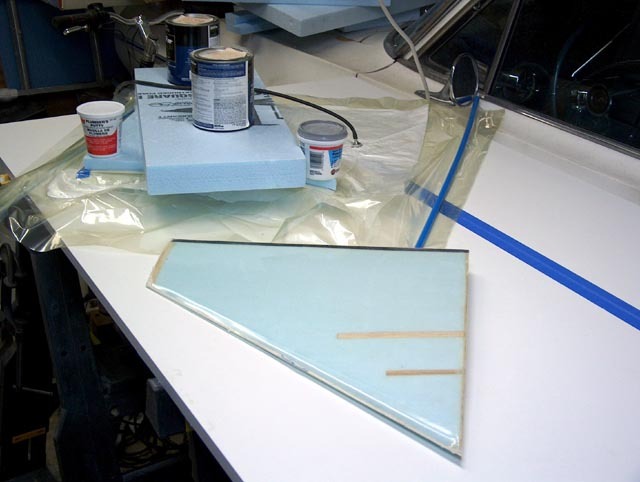 I then taped off the areas that I did not want the resin to stick to and added some vasoline for safety. 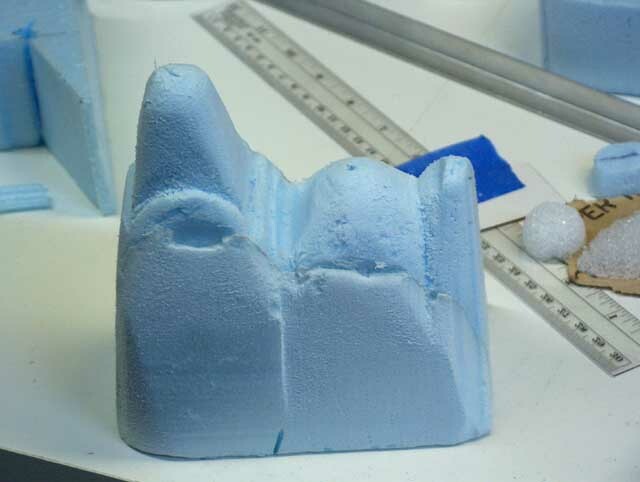 After glassing, I just dremeled along the cut in the foam and it came right out. 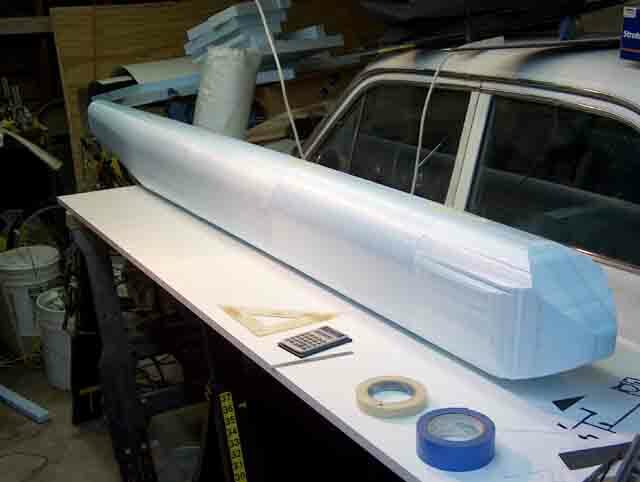 The wing will bolt to the plywood plaforms as well as being permently glued there. I will have to build back up the curve of the airfoil towards the front of the saddle, but I don't have the wing made yet, so I thought it would be safest to just make a flat saddle. Having the trailing edge of the airfoil level with the fuselage will give me about 3.8 degrees of positive incidence. This matches the look of the actual B-52. 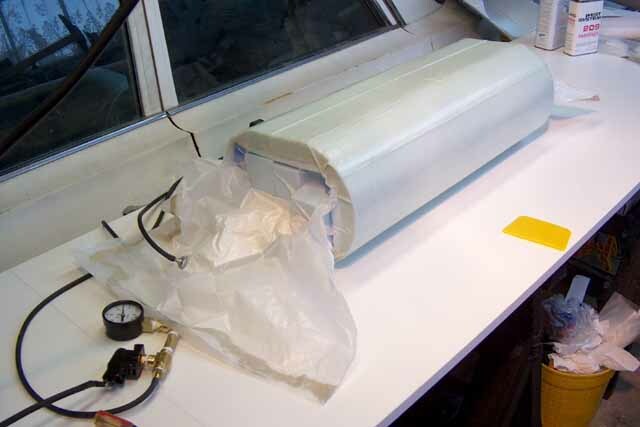 Over the weekend I did the final vacuum bagging of the main fuselage, to get the nose covered. Came out pretty rough, but the electric sander made short work of the extra resin and wrinkles. Now it is on to the tail section. Weight of the main fuselage is 6.5 pounds now. The tail section should add a couple more. I am not sure where I am going to do the maiden flight. If the wing loading is not too high, I may just go with my familiar "home hill", Glider Point. 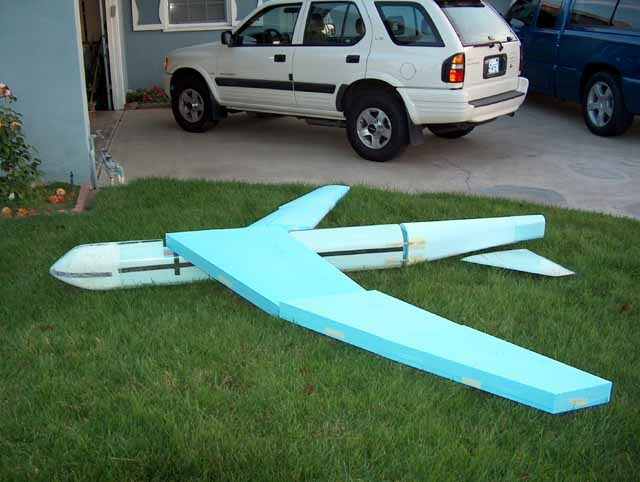 I plan on doing the maiden flight before I do all the finishing work, just in case I crack it up. Once I got the plane dialed in, I will do all the pretty stuff for the PSS festival. At least I am pushing to get this done by the PSS festival. It is hard finding the time to work on it during the week. On another note, the wings are "in the que" over at FlyingFoam. 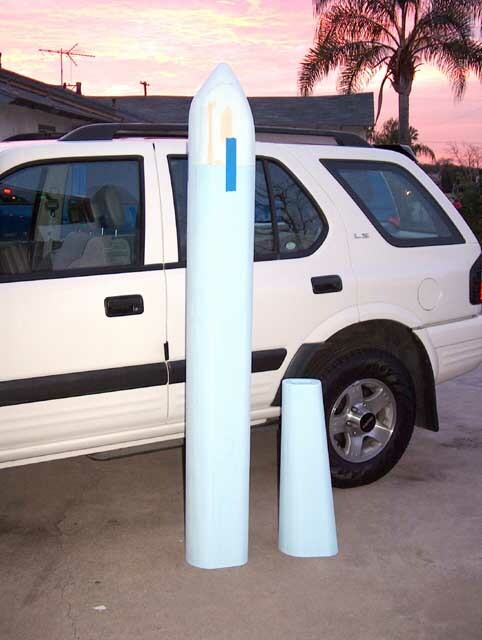 Hopefully I did all my math right, these are going to be expensive foam cores to have cut. 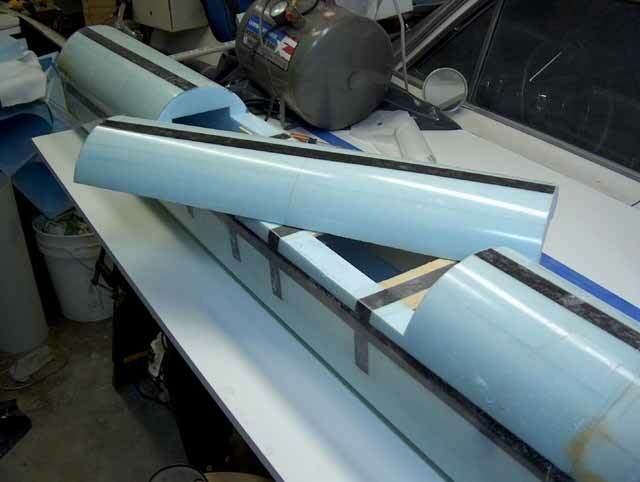 They are going to be made in three sections per side out of blue foam and use three carbon tubes for spars. 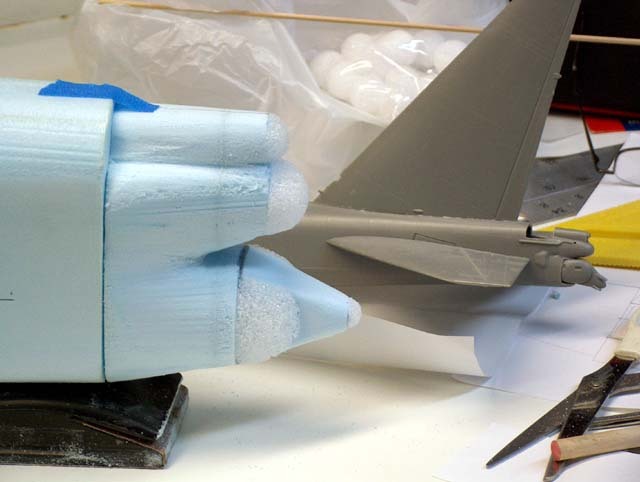 The wing sections occur where the engine pylons attach, to make for easy access to hard points to mount the pylons. 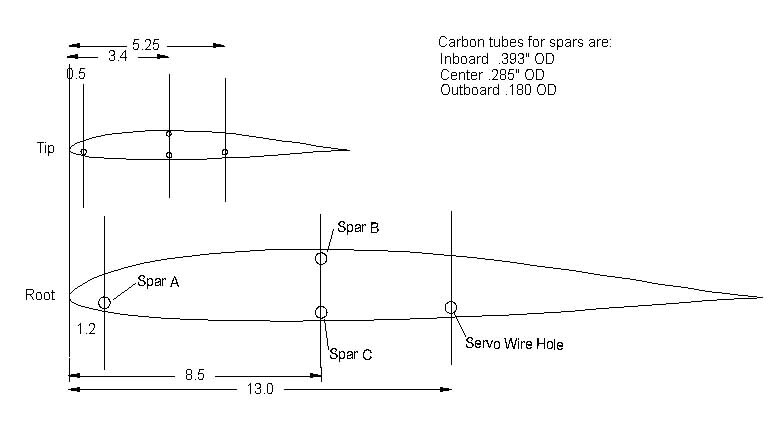 The carbon tubes will slide one inside the other to make the joint between the wings. 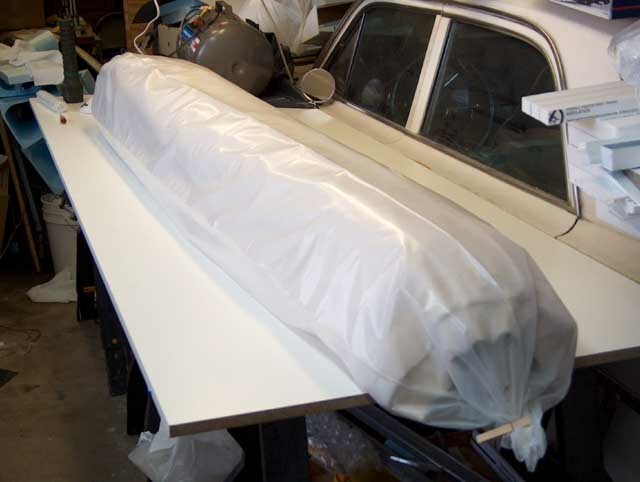 The wings will be vacuum bagged with one layer of carbon fiber and probably one or two layers of 6 oz fiberglass. Bagging the wings should be easy, compared to my weird bagging of the fuselage. 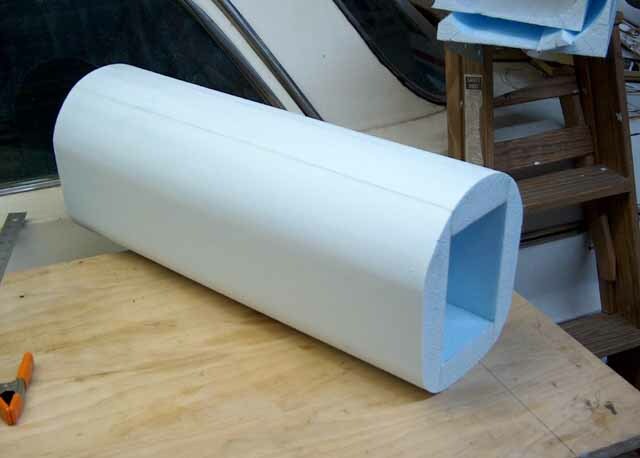 The I digressed into designing the elevator mechanism and cutting foam cores for the elevator. The tail feathers are so heavily tapered that it is hard to get a good core, but I made a go at it and I think they might work. I guess they better, I am almost out of blue foam. 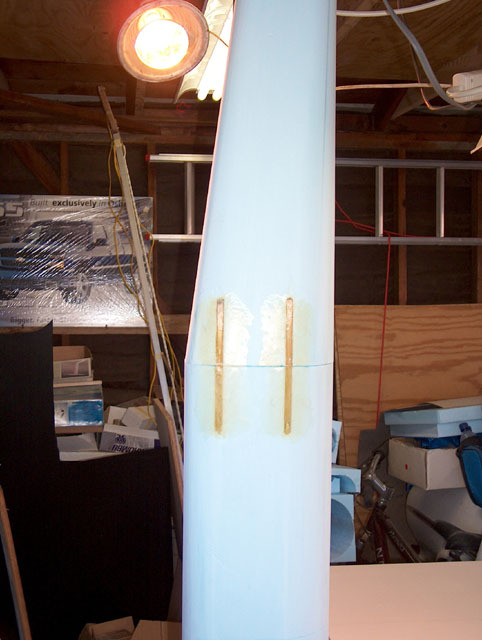 Still have not fiberglassed the tail section of the fuselage, but I have continued my digression into doing the elevators. Got one in the bag and one done. Not perfect, but not bad for my first vacuum bagged airfoil. 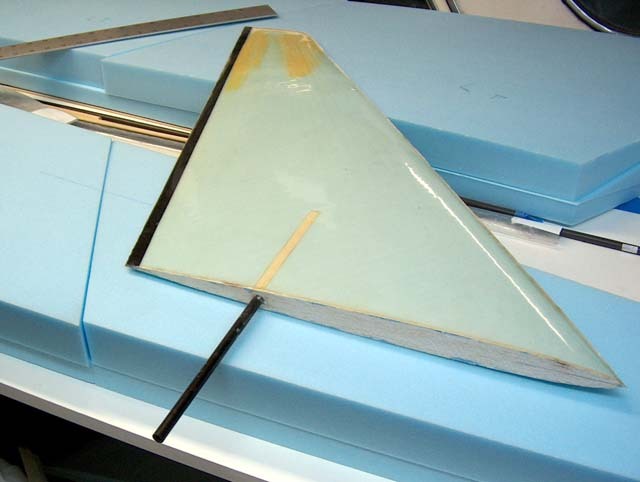 It is amazing how sharp and straight you can get the trailing edge with this process. Hats off to Bob at FlyingFoam.com for doing a superb job making these rather complicated wing cores. This is going to be a BIG plane!. 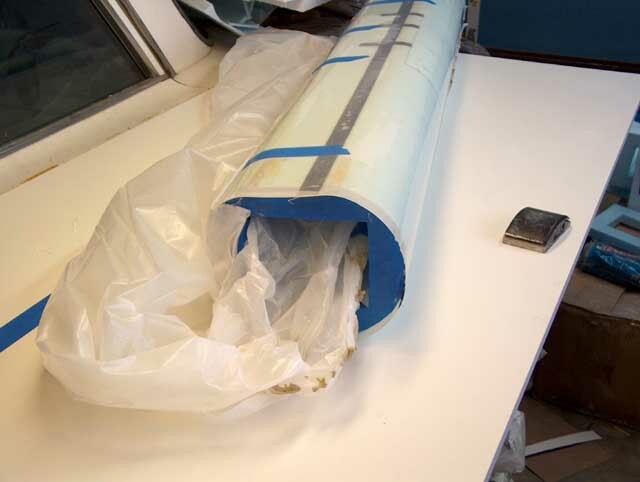 Not much new to show, just "rudder on a stick" fresh from the vacuum bag. 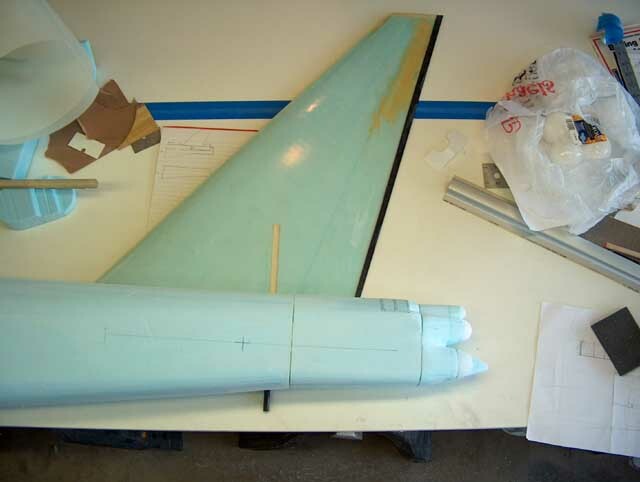 For those of you paying attention, you may be wondering why I have not fiberglassed the tail section of the fuselage and skipped ahead to the evevator and rudder. Well, like most projects, sometimes you run into something that is frustrating. In this case, the tail end of the aircraft has had me stumped for month or so. Carving out the detail for the guns and radars has proven difficult. My first attempt at the tail end. You can see why I was getting discouraged. The I got the idea of using styrofoam balls from the craft store This was a big help, since the spherical parts were taken care of and I just had to shape to the drawn circles on the blue foam, rather than my sad attempt a doing it all free form. Now I just need to carve in the area where the tail gunners window transitons to my tail piece. 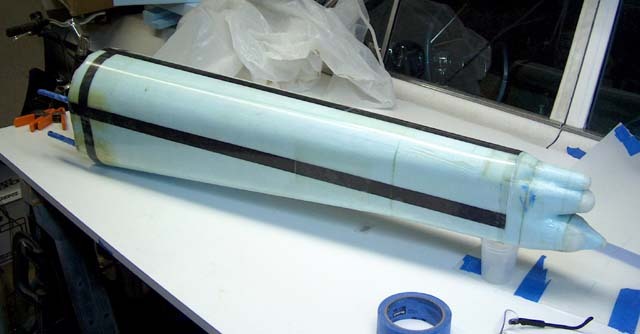 After that I can do a small fiberglass lay-up on the tail details and then do the big vacuum bagging of the rest of the rear fuselage. 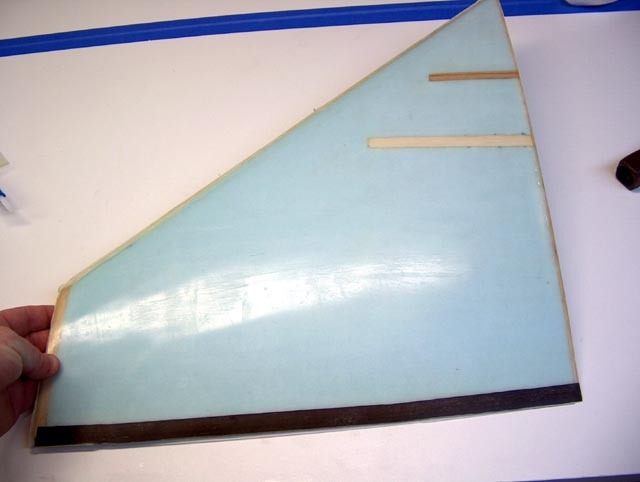 Here is the tail section glued on with the rudder in the background. I have the first vacuum bagging of the rear section done. Just have to go back and bag the bottom and it will be done (except for the sanding and filling ). Then it is on to the wing!!!! 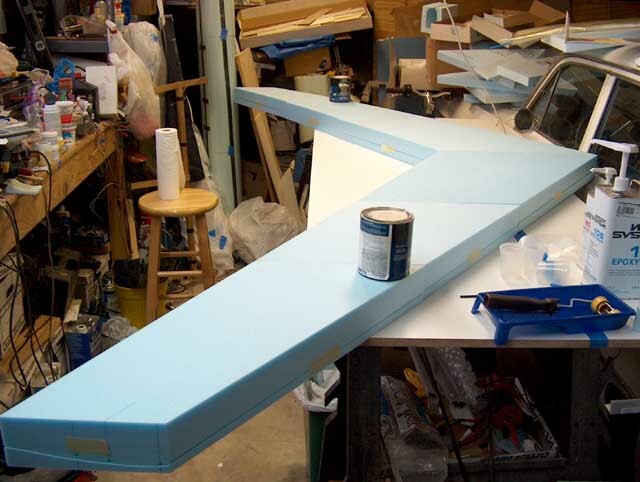 The wing should go pretty fast, although as I build it in my head, I am thinking of adding an aluminum bar joiner where the wings come off, to supplement the carbon fiber tubes. Since repairing it would be as much work as making another, I am just going to saw off the end section and apply that to a new hollow section, replacing the imploded part. But I will still have to setup the dowels again, which was a bit tricky. But having done it before makes it easier to do again. On a project like this, it seems you spend more time figuring out how to build something than actually building it.